When heating a building, there are dozens of possible systems that you could use. Some of the most popular include baseboard convection heaters, forced hot air systems, radiant floor heating and numerous others. In fact, there is no single heating system type that is always the proper for every installation. Rather, the correct system will depend on several factors, including; type of building, the climate it is located in, the size of the heating load and budgetary constraints. Solar thermal systems are simply another type of heating system that you can use in your construction, and there are several different system designs for you to choose from. Like others, each type of solar thermal system has it’s own benefits and drawbacks and it will be up to the contractor to determine the proper system for the site. 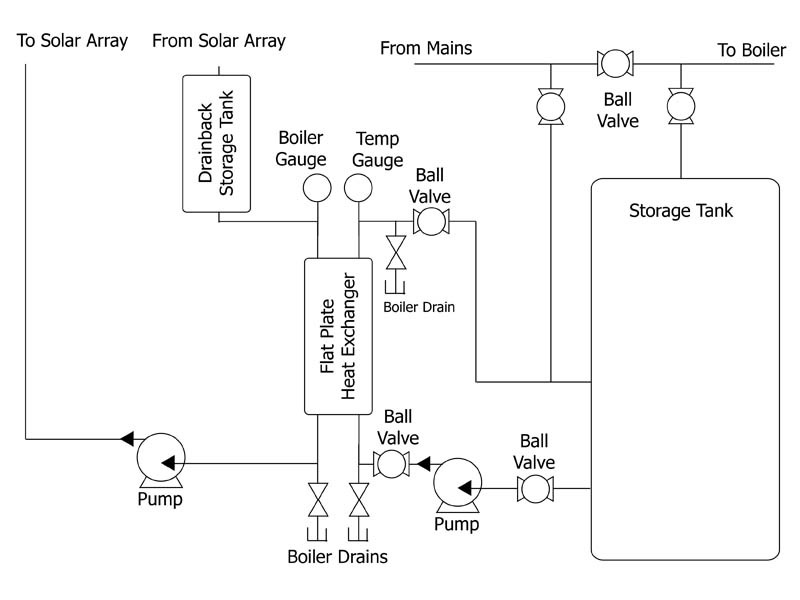 Basic P&ID (Piping & Instrumentation Diagrams) schematics are shown below for common commercial solar heating applications. There are also brief descriptions of each system type explaining its capabilities and limitations. 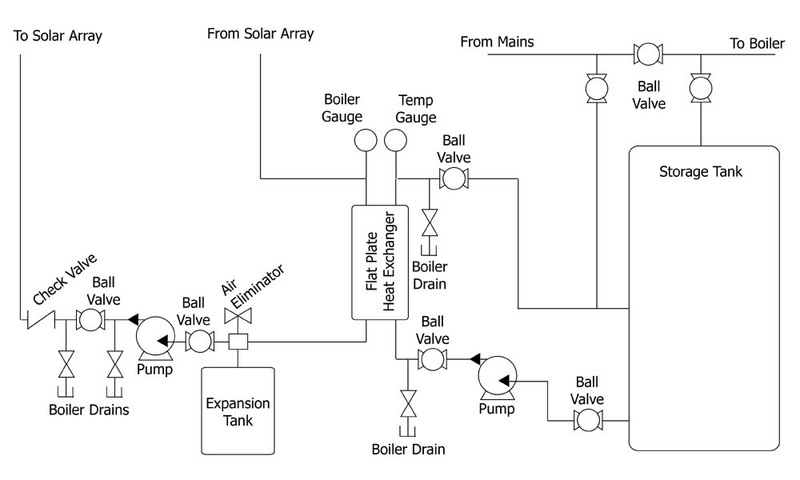 The open-loop system is the simplest and most efficient solar thermal system design. The reason? It has the fewest components where heat can escape from the system because the potable water is taken from the storage tank and circulated directly through the solar collectors and then sent back to the storage tank. 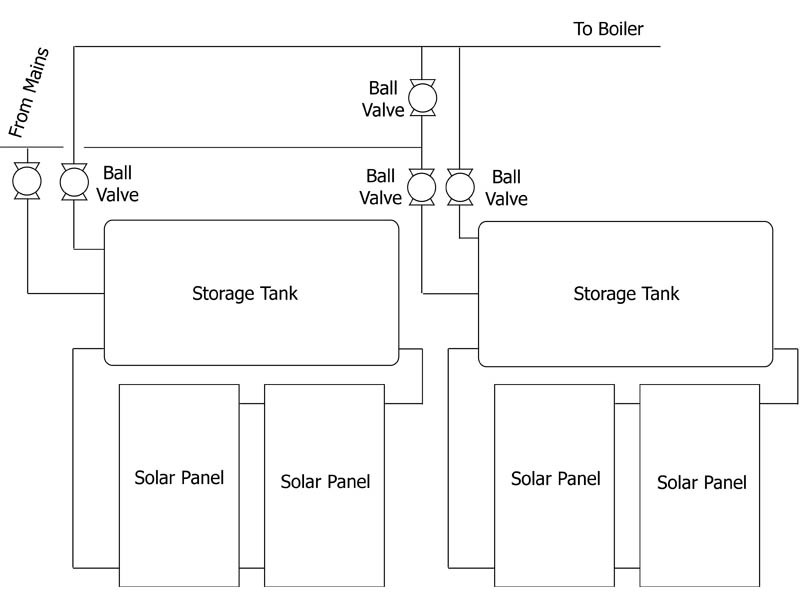 Mechanically, the open-loop solar system is nearly identical to a boiler heating system (except that it uses a solar array as the heat source). The open-loop system is primarily used in non-freeze areas, such as coastal California and Florida because of the possibility for freeze damage. Some of the risk is mitigated with the recirculation of fluids and the thermal blled valves, however, be careful with this system type. To eliminate the problems of freezing and scaling, Closed-Loop Glycol systems use a food-grade propylene glycol (anti-freeze) as the heat transfer fluid within the solar loop. In the right concentrations, this glycol HTF can stand up to temperatures as low as -60F. Your potable is kept separate (and safe) from the glycol through a heat exchanger (in this case, a coiled copper heat exchanger built inside the storage tank. 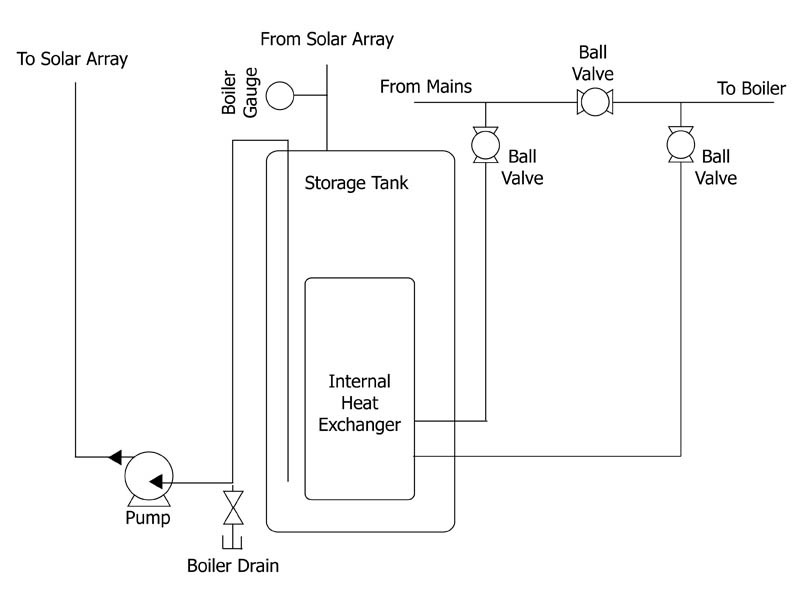 The heat exchanger transfers the heat from the glycol of the solar loop to the potable water within the storage tank. The closed-loop glycol system with an internal coil heat exchanger is one of the most popular types of solar thermal systems used today. Your potable is kept separate (and safe) from the glycol through a heat exchanger (in this case, a brazed plate flat heat exchanger external of the storage tank). The heat exchanger transfers the heat from the glycol of the solar loop to the potable water within the storage tank. 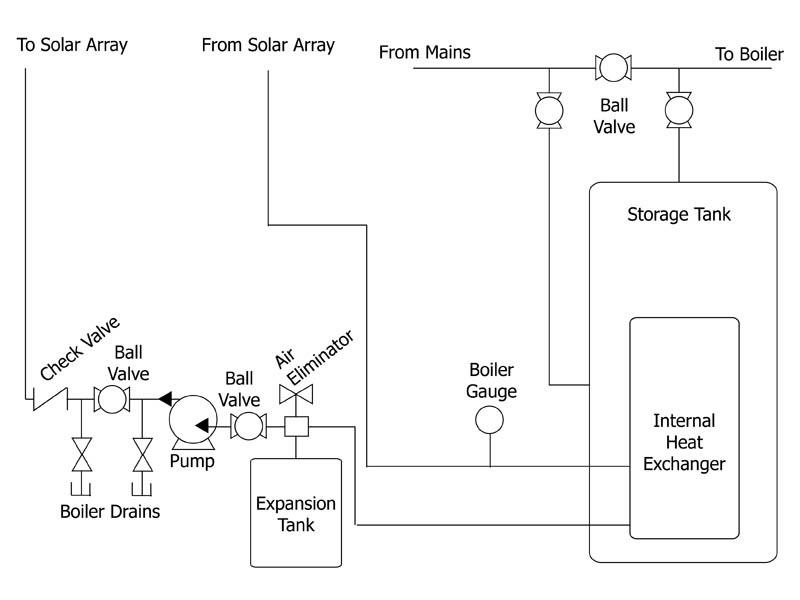 The closed-loop glycol system with an external brazed plate heat exchanger is one of the most popular types of solar thermal systems used today. Similar to glycol systems, Drainback systems use a closed-loop system design with a heat exchanger to help with freeze protection. However, instead of using a glycol solution for freeze protection, drainback systems allow the water within the solar loop to drain down into a smaller secondary storage tank (called a drainback tank) when the pump is off. The drainback system with an internal heat exchanger uses a coiled copper heat exchanger built within the storage tank for heat transfer from the solar loop to the potable water. The drainback system with an external heat exchanger uses a brazed plate heat exchanger that separates the solar loop from the potable water loop. The drainback system with a load-side heat exchanger functions differently than the other drainback systems, and any other solar thermal system listed here. 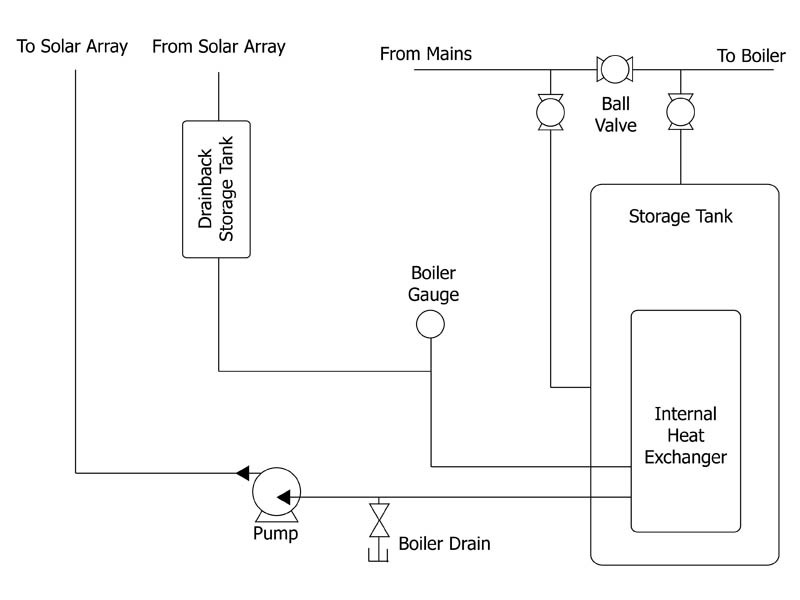 In this system type, your potable water is transferred through the internal heat exchanger and the storage tank is filled with the HTF on the solar loop side of the system. The major advantage of this is that lower cost unpressurized storage tanks can be used with this type of system (this can help cut costs dramatically). The only drawback is that a larger than normal heat exchanger will be required as it must meet the heating needs of all loads in near constant charging. Thermosyphon solar thermal systems are typically used for smaller residential applications. However, multiple thermosyphon solar collectors can be strung together to meet the needs for larger commercial applications. 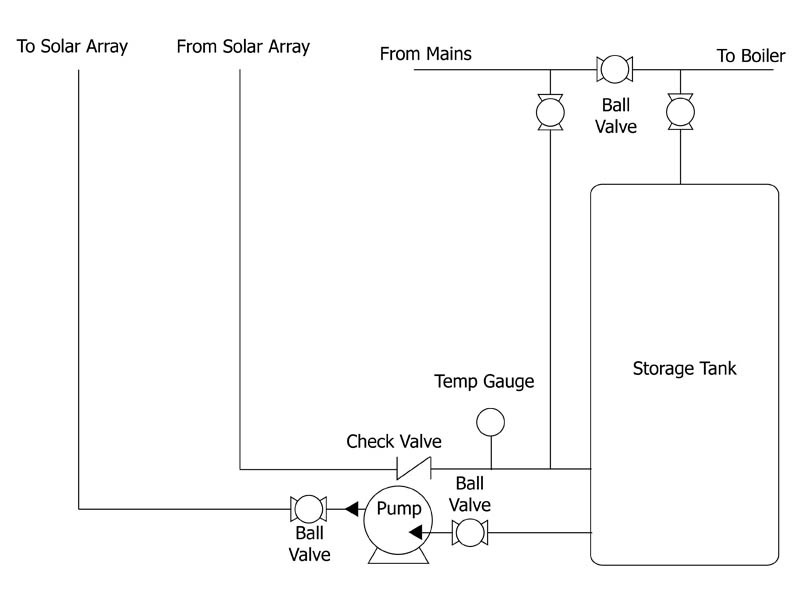 Thermosyphon systems can be created using both evacuated tube and flat plate solar collectors, and typically use 1 to 3 collectors per storage tank (typically under 100 gallons). SunMaxx also carries pre-packaged thermosyphon kits in 40 and 80 gallon capacities (they can be used singly for residential applications, or combined together for larger solar thermal applications).